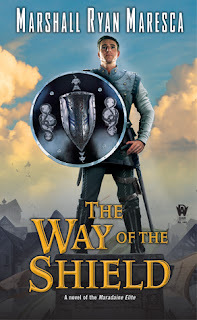 The Way of the Shield is the start of a new fantasy series from Marshall Ryan Maresca. 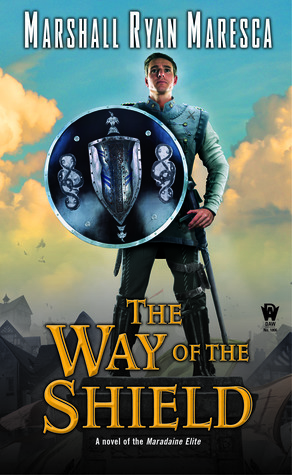 It shares a setting with his other series – the sprawling metropolis of Maradaine, populated by mages, vigilantes, police investigators, criminals, cults, politicians – and now, knights. The centre of the narrative is Dayne. Dayne is a member of the Tarian order, a group of heavily armed individuals with a code. There used to be more of these orders, but they’ve been slowly subsumed into the army and other government initiatives over the years, and now only the Tarians and one of the others are left. Dayne is an exemplar of Tarian values – keen to help those who can’t help themselves, and to protect lives. He has a degree of guilt for his inability to stop the deaths of those tht he’s protected in the past – but the Tarians demand he gets up in the morning, picks up his shield, and goes on to see what’s text. Dayne is almost worryingly wholesome. He’s perpetually self-deprecating and self-punishing, at the same time as he lvies up to all the higher ideals of his order. A nice guy, but stern – a paladin in the making. Fortunately, perhaps, he’s backed up by a posse of other characters with their own flaws, I particularly enjoyed his friendship with a group of newspaper-folk, which provided the opportunity for exposition, some charmingly sharp witty banter, and a chance to explore the subtext of the role of the press in a less-than-free society. Because that’s what Maradaine is, to be sure. It’s a metropolis, a city whose economy is thriving, whose people are surging through the streets. But it’s a city whose body politic is moribund. There’s a king who seems absent, and a parliament populated by the rich, the venal, the power hungry, or some combination of all three. Parliament represents the people, as long as the people are people like themselves – and that leaves those outside their circle fuming and aware of the injustice. If you can vote, but your vote will bring in one of two identical candidates – then where’s the choice? The Maradaine electorate is on the boil; the air of the city thick with tension. Into thishotpot of havoc slides a conspiracy – I won’t get into details here, but they plan to change Maradaine’s politics, they would claim for the better. If the detailed, in-depth world-building is one of this book’s strengths, another is its antagonists; their goals are, if not laudable, at least understandable in a world of realpolitik. If their means are unpleasant, involving riots, deaths, assassinations, they’re backed by the pragmatic service of an achievable goal. These are not villains in their own minds, and we get some exposure to their point of view. In another book, they might even serve as the heroes; here though, they are reflected in Dayne’s moral certitude, and found wanting. That said, Dayne’s not on his own; he’s backed by a Tarian trainee, and her attitude can mostly be described a stubborn and fierce. In between debates with the press-gang, seeing her work with Dayne is a joy. The fights are gloriously choreographed and kinetically hefty; you’ll taste the iron in the back of your throat, and slip on the blood on the floor from the drawn blades. This is an adventure story. Dayne throws himself into righting wrongs, almost by accident. If he carries his own guilt, that just makes him more genuine. Despite his competence, his relative youth seems to leave him emotionally vulnerable in a city filled with movers and shakers with less moral rectitude and more emotional armour. But Dayne does right wrongs, and does so with a force of personality which you can feel pervading every word on the page. This is a story of heroes. Dayne, for sure, the moral beacon. But his friends bear him up, and keep hom facing in the right direction. His trainee – well, she’s amazing. Stubborn, forceful, confident in her own capability, refusing to take any crap from anyone. If Dayne is the centre, the spine of the story, she and his other friends are the muscles. It's a poitical story, one which both demands and rewards your attention. It’s a personal story, dealing with pain, loss, heartbreak and forgiveness. It’s a story about morality, about sacrifice, about what people want from life. It’s a fun story – there’s quips, swordfights, chases through the streets. It’s a compelling, convincing work of fantasy, and a worthy addition to the rich tapestry that is the works of Maradaine. Pick it up, give it a try – you won’t be disappointed.